Acht! It's perfect that you wait until everyone's forgotten utterly about the contest... makes for a better surprise then! I'll definitely be checking this book out. Sounds like a keeper. oo - thanks for sharing the news about the Knitting Club movie! That will be fun. 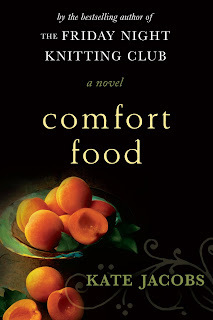 I just finished Comfort Food...it was fun, but it was a different feel...I was less emotionally invested...it was cool though, having lived in Westchester to imagine the locations...especially the weekend trip - how funny! If they make Comfort Food a movie, imagine how fun it would be to cast "Gare"! What a cameo that would be! I totally forgot about this, but in an interesting coincidence, am actually reading this book RIGHT NOW. Weird. Wow!!! I'm in total shock that I won!! I read your blog everyday and completely forgot about this contest - but I am beyond thrilled that I won! Thank you sooooooooo much!!!!! Ooh! I'll look into the audio version for my (blind) son who loves recipes and food! How much fun, evey one is totaly surprised! And I found two more books to read and a movie to watch.What you said about sharing is so true.
" where we believe the only thing better than discovering a wonderful new book is sharing your discovery with fellow book lovers."